Ecosystem engineers are species that physically transform their surrounding environment. The classic ecosystem engineer example is the beaver; by cutting down trees and damming a stream, the beaver alters a tremendous amount of habitat. This transformation allows for the persistence of other species that, if not for the beaver, wouldn’t survive. Crabs of coastal salt marshes similarly alter their environment. Salt marshes once encompassed the majority of temperate coastlines throughout the world. These ecosystems provide numerous services such as protecting inland properties from storm surge, providing a nursery for many commercially important fishes, and mitigating climate change by sequestering large amounts of carbon from the atmosphere. But salt marshes aren’t composed of only soil and vegetation. The fiddler crab is a small (less than one inch wide) crustacean that thrives in these coastal ecosystems. The crab burrows beneath the vegetation and feeds upon the nutrient rich soil. The presence of the burrowing fiddler crab helps the growth of plants by facilitating plant root growth, improving the drainage of wet soils, and improving the above ground shoots (Bertness 1985). Another crab found in many New England salt marshes is the herbivorous purple marsh crab. The purple marsh crab feeds upon the grasses growing in marshes, ultimately leading to the decline of carbon uptake in the salt marshes. What is the Effect of Crabs? How do crabs collectively impact the salt marsh community? Alexandria Moore from Yale University was determined to find out. In the summer of 2017, Moore created 24 pseudo-marshes in 50-gallon tanks. These tanks were filled with local soil, planted with salt marsh grass (Spartina alterniflora) and were flooded with seawater. Twelve tanks were inhabited by either fiddler crabs or purple marsh crabs, six tanks were occupied by both species and the last six tanks were left without any crustacean residents. Moore was pinching to observe how the presence of each species impacted the organic matter within the soils, the absorption of nitrogen, and the health of the marsh grass. The presence of crabs actually increased the amount of area covered by vegetation. And the tanks that were occupied by both fiddler and purple marsh crabs had the greatest amount of grass shoots in terms of weight. Crab-occupied tanks also tended to have greater rates of nitrogen absorption and generally had more organic soils. These findings suggest that crabs do play a significant role in salt marshes, specifically by aiding the growth of salt marsh plants. The most astounding finding was that the herbivorous purple marsh crab indirectly supported salt marsh vegetation rather than consuming the above ground shoots. This was due to the fact that burrowing increased aeration of the soils and essentially tilled the soil to improve the growing conditions of the plants. 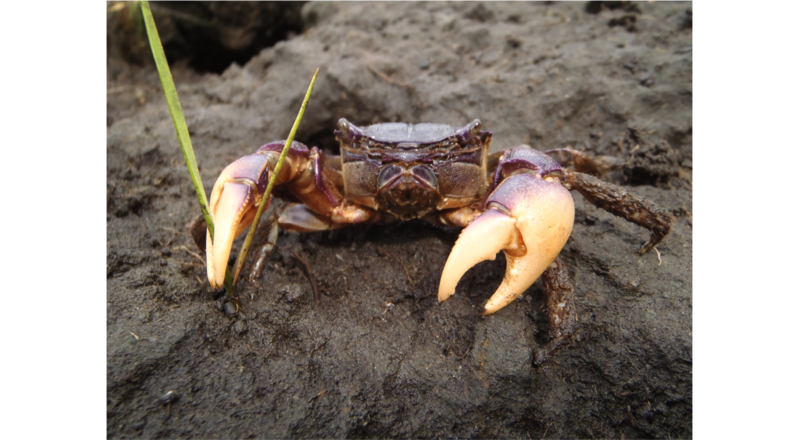 With the purple marsh crab, the grass growth was greater than the overall consumption. This effect was even greater when both species of crab occupied the same tank. Previous studies with purple marsh crabs suggested that these crabs limited salt marsh plant growth potential. Findings by Moore show that there is more than what initially meets the eye when it comes to interactions organisms have with their environment.